$248.25 - Baxton Studio BBT6326-Full-Grey Quincy Grey Linen Full Platform Bed - 38.61 x 61.43 x 82.29 in. Home Furniture>Bedroom>Beds>Beds Baxton Studio BBT6326-Full-Grey Quincy Grey Linen Full Platform Bed - 38.61 x 61.43 x 82.29 in. 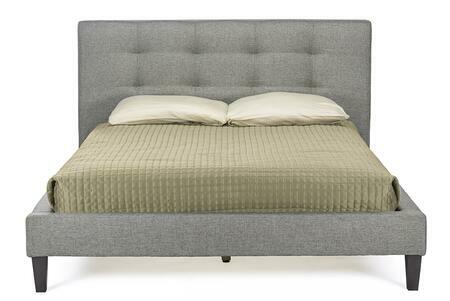 Baxton Studio BBT6326-Full-Grey Quincy Grey Linen Full Platform Bed - 38.61 x 61.43 x 82.29 in. Modern and minimalistic the Quincy Designer Bed is paramount for the most stylish and comfortable of bedroom retreats. 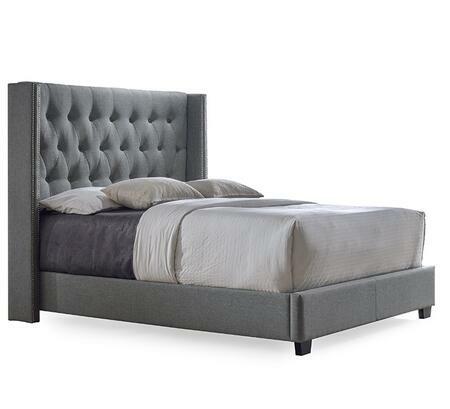 This full-sized upholstered platform bed frame is made of both hardwood and MDF and is fully upholstered in grey linen with underlying padding. The upholstered headboard features an attractive tufted look with seams pulled inward at the corners of the fabric panels. A slatted base makes this a platform bed with no need for a box spring. Baxton Studio BBT6140A2-Full-Grey DE800 Annette Gray Linen Modern Bed with Upholstered Headboard - Full - 35.63 x 56.5 x 80 in. Turn in for the night atop a dream of a bed in beautiful upholstery! Annette is a fashion-focused modern platform bed with hints of mid century style yet is inconspicuous enough to suit your favorite bed linens. Lovely Annette is made in Malaysia with care: a hardwood and plywood frame is the basis for the gray linen-like fabric upholstery which is then softened with an underlying layer of foam padding. Being that Annette is a platform bed only a mattress not included is required--a set of wooden slats included provide support similar to that of a box spring rendering use of one unnecessary. Richly-colored dark brown wooden legs are a chic finishing touch. Though this version of the Annette Designer Bed is a full size with gray upholstery it is also provides in light beige and in queen size gray and light beige each sbtained separately. The contemporary bed frame is packed snugly in cardboard cartons and requires assembly upon unpacking. The Annette Bed must be spot cleaned when needed. Baxton Studio CF8611-Full-Grey Katherine Contemporary Grey Fabric Nail Head Trim Full Wingback Bed - 55.5 x 61.38 x 81 in. Modern rich details make the Katherine Fabric Nail head Trim Wingback Bed a luxurious way to be an Additonal style to your master bedroom. The bed has quality wooden frame made with foam padding and supported by the espresso finished wood legs. 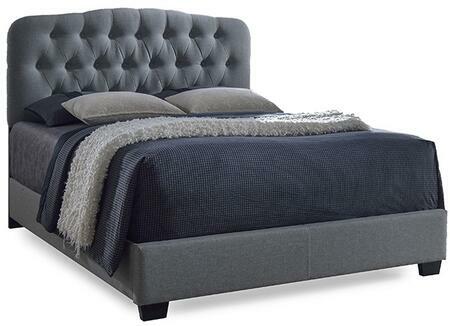 Beautifully nail head trim upholstery made headboard with wingback designs features for the use of box spring. Sometimes what you need is an inviting comforting bed to come home to - the Harlan platform bed fits that bill. While adhering to a modern aesthetic the classic mission style-inspired design is cozy and unpretentious. The Harlan is built to last with a poplar and rubberwood construction so that's one less thing to worry about. This platform bed features a vertical slat design on the headboard and footboard making this bed easy to coordinate with the style of your bedroom or guest room. The Harlan is in brown dark brown grey and white-finishing with options in full and twin size. This platform bed is designed for use with one mattress. Made in Malaysia the Harlan requires assembly. The Sedona platform bed is proof that simple minimalist designs can also be warm and inviting. This modern spin on the classic mission style is a sure way to add a comforting vibe to your home. Made of poplar and rubberwood the Sedona is built to last. This bed features a horizontal slatted design on the headboard and footboard making it easy to coordinate with a variety of looks. The Sedona would make a charming addition to your bedroom or guest room. The Sedona is in brown dark brown grey and white-finishing with some options in full and twin size. This platform bed is designed for use with one mattress. Made in Malaysia the Sedona requires assembly. Baxton Studio SB338-Full-Cappuccino Schiuma Cappuccino Wood Contemporary Full- Bed - 33.5 x 57 x 78 in. Our Schiuma Wood Contemporary Full-Size Bed provides understated styling without cutting corners on quality. Featuring genuine rubberwood construction this essential bedroom-furniture element provides an actual carved classic design on the headboard. The cappuccino finish lends warmth to any bedroom. Baxton Studio SB337-Full-Cappuccino Spuma Cappuccino Wood Contemporary Full- Bed - 33.5 x 57 x 78 in. Baxton Studio BBT6440-Full-Pink Canterbury Pink Leather Contemporary Full Bed - 39.88 x 56.5 x 80 in. Understated elegance lies at the core of our Canterbury Leather Contemporary Full-Size Bed. With its white faux-leather accenting crystal tufted headboard and chrome legs this contemporary platform bed recalls a time of opulence . This seemingly impossible pairing makes the Canterbury a fantastic value in contemporary bedroom furniture. Baxton Studio BBT6440-Full-Black Canterbury Black Leather Contemporary Full- Bed - 39.88 x 56.5 x 80 in. Understated elegance lies at the core of our Canterbury Wood and Leather Contemporary Full-Size Bed. With its black faux-leather accenting crystal tufted headboard and chrome legs this contemporary platform bed recalls a time of opulence . This seemingly impossible pairing makes the Canterbury a fantastic value in contemporary bedroom furniture. Baxton Studio BBT6440-Full-White Canterbury White Leather Contemporary Full- Bed - 39.88 x 56.5 x 80 in. Understated elegance lies at the core of our Canterbury Wood and Leather Contemporary Full-Size Bed. With its white faux-leather accenting crystal tufted headboard and chrome legs this contemporary platform bed recalls a time of opulence . This seemingly impossible pairing makes the Canterbury a fantastic value in contemporary bedroom furniture. Add a touch of comfort and style to your home with the Nereida platform bed. The classis mission style of the bed is updated with a modern flair making it easy to coordinate with your aesthetic. Constructed of poplar and rubberwood the Nereida is built to last. The bed features a horizontal slatted headboard design that would feel at home in a wide range of decor from rustic and coastal all the way to modern. The Nereida is a cozy addition or upgrade to your bedroom or guest room. This platform bed is in grey white with dark brown and white with dark gray finishing. The Nereida bed is designed for use with one mattress. Made in Malaysia this bed requires assembly. The Catalina platform bed is the perfect blend of modern and classic mission style-inspired design. The subtle panel design on the headboard and footboard are quintessential mission-style while the overall solid coloring and clean lines make this bed seem at home in modern homes. The Catalina is built to last with a poplar and rubberwood construction. This bed will add warmth and a cozy vibe to your bedroom or guest room with its inviting yet simple look. The Catalina is in brown dark brown grey and white-finishing with some options in full and twin size. This platform bed is designed for use with one mattress. Made in Malaysia the Catalina requires assembly.